The hard work and persistence of the river guards to protect the Irrawaddy dolphin in the Mekong Flooded Forest (MFF) landscape contributed to the first recorded increase in the population in over twenty years. This is no small achievement and the contribution of the MFF law enforcement team to this positive outcome, specifically the river guards that patrol the Mekong River, cannot be undervalued. Over the period from January – June 2018, the river guards conducted over 2,296 patrols both during the day and at night. The time that the guards spend on patrol is time away from their families, with limited access to medical facilities, in challenging conditions and often for very low pay. The reason for the significant amount of patrols is because it is the responsibility of the river guards to patrol the Mekong Flooded Forest protected area which covers over 27,450 km2, meaning that constant patrolling is necessary for adequate law enforcement and to protect the dolphins against preventable threats including gillnets and electroshock fishing. A log of illegal materials confiscated and the number of fishermen educated is kept in order to monitor the progress and effectiveness of patrolling techniques employed by the river guards. In total, over 906 gillnets were confiscated whilst on patrol, which totalled approximately 49,260 metres of netting. In addition, there were 189 hooks attached to long lines confiscated which when added together was an incredible 30,047 metres in length. However, this is not the total amount of hooks confiscated, which when counting singular hooks, was approximately 10,672. Another significant human-imposed threat to fish and dolphin populations in the Mekong River is the use of electrofishing as a method to catch fish. It involves sending an electric current through a body of water which stuns the fish in order for the fishermen to catch them – which is an illegal method of fishing. In total, there were ten instances of electrofishing spotted and subsequently stopped, with nine toolkits and five boats confiscated. Education is another important role undertaken by river guards, as often those participating in illegal activities are unaware of the illegality of their actions or of the detrimental impact it can have on the river system and how this can flow on to have long-term consequences for their livelihoods. In total, the river guards oversaw 84 instances of education to fishermen on the illegality of their fishing techniques and the impact of these unsustainable methods on the long-term health of the Mekong River. In total, this amounted to 319 fishermen receiving education and taking part in awareness raising initiatives. In terms of formal enforcement, there were 27 individual warning letters issued for illegal activities conducted within the conservation landscape, including the types described above. In addition, there were four warning letters issued to fish traders. WWF continues to support the river guards who work on the frontline of conservation efforts and provide essential protection to one of WWF’s flagship species, the Irrawaddy dolphin. Intensive coaching and training are provided to the river guards and the equipment necessary for effective patrols is provided. This has no doubt contributed significantly to the positive results of an increase in the recorded population of the river dolphin. 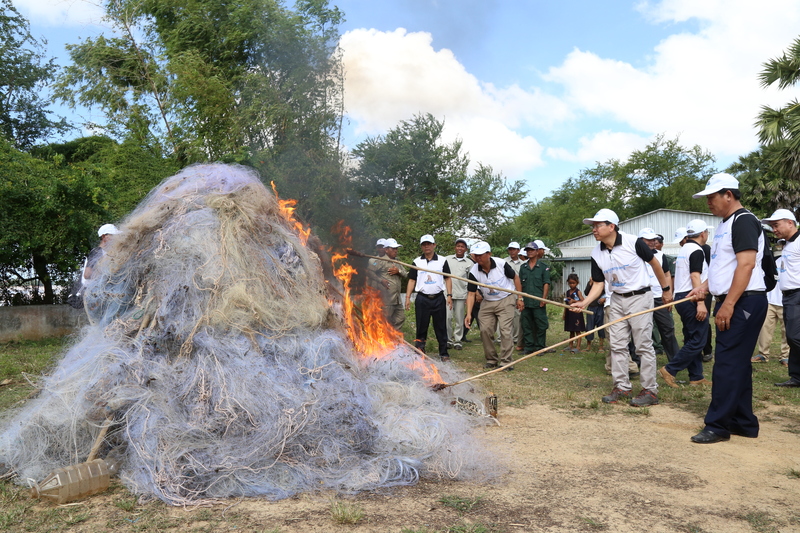 MFF team burnt confiscated gill nets.